Our sweet canines are stars in themselves but what happens when a star (canine) falls in love with a star (a celebrity). Well, the combo is terrific. 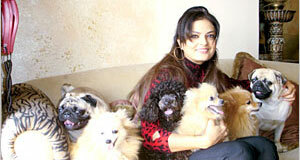 Here’s more about our celebrity Sheeba and her pet dogs. Yesteryear Bollywood actress Sheeba has acted in more than 25 odd films. She made her debut in a Tamil film titled Adhisaya Pirvai where she co-starred with south-Indian stalwart Rajnikant. The fi lm got a pretty good opening at the box offi ce. She made her Bollywood debut with the movie Yeh Aag Kab Bujhegi. She has also acted opposite Salman Khan in the hit movie Suryavanshi. Last of her commercial success includes her role in the Hritik Roshan starrer Koi Mil Gaya in 2003. I always had a variety of pets throughout my childhood but my fi rst pet dog was a white Spitz named Saika. After Saika, there was a Miniature named Faith. 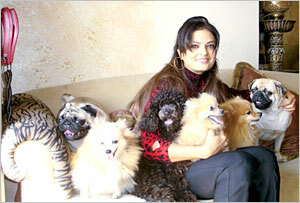 Other favourite pets include Fame, Fortune, Fun, Frolic, Filmy, Flower, Puchka, etc. Even though I loved them all in their special ways, but Faith and Fortune do stand out in my memory. Every canine has special traits of their own. Once a dog of mine found her way home from 10k, a friend’s place where I left her for the day. She came back home on her own. It was simply amazing! At present, I have 6 dogs, one of them loves toys, so I am always buying her toys. But once I get home with a new toy, all six of them follow me around like I am the pied piper. Cookie, Masti and Jerry are grand children of our pets while Chocolate, the Pug, was a gift from my brother Jaidev to my son Bhavishya. Fudge, the Pug, was a gift from my mom to my son Hriday and Mantra is the Poodle, we got from a friend’s litter. I personally groom them everyday, feed them breakfast everyday and take them on outings very often. I give fresh and nutritious food to my pets everyday and they gobble it instantly. But they all hate exercise except my Poodle Mantra and one of the Pugs Fudge who loves to run around. They love to gorge on cheese, peanut butter, mutton bones, biscuits, etc. Their all time favourite being the ever-delicious peanut butter and ice-cream. I particularly admire their undying love and affection and the fact that when I spend time with them, I feel so happy and de-stressed. What really irritates me is that they like to pretend they are not housetrained when I don’t spend time with them. My Pugs love to really chew my feet hard at every step I take around them. That I guess is their way of sulking! They know I love them unconditionally and they particularly like that I share all my food with them. In fact, they must taste everything I eat. They love it when I groom them and take them for drives. My pets love going to the farm with us in Lonavala. Treat them like family members and you can never be wrong for making them a part of your life.